Here is my first update in regard to the planned Ozark Medieval Fortress that will be opening to the general public in the spring of 2010. My first post on this amazing project with pictures of the construction which started in June of this year can be found here. Noémi Brunet shared with me the following drawings and gave me permission to post them on my blog. 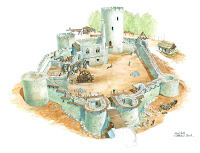 This is what the Ozark Medieval Fortress should look like in the year 2010. And what it should look like when it is finished, projected to be in the year 2030. May we all live long enough to see it completed! It's amazing how loosely the stones are jointed ! They won't make it to the top ! I dare speak out as a long term volunteer at the ORIGINAL site of Guedelon. I'll keep updated with your blog as I don't know when I can see the place for myself. I sincerely wish the copy won't deface the genuine idea. I do not share your concern for I know that Michel Guyot makes regular trips to the site to oversee how construction is going. 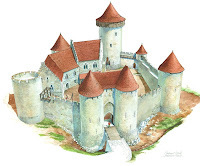 There has been a lot of knowledge gained from the process of building Guédelon in France and the Ozark Medieval Fortress will benefit from being able to learn from mistakes made at the original site. For example, I remember hearing that it took quite a while to find the right mixture for the mortar compound. The trial and error method for the beta site will consequently go much faster than it did at the alpha site. You should also check out the website at Ozarkmedievalfortress.com for more pictures of the ongoing construction. They have recently updated their website and it looks fabulous. Thank you for stopping by and for being a volunteer with such an amazing project!